Aristotle once said that the whole is greater than the sum of its parts. 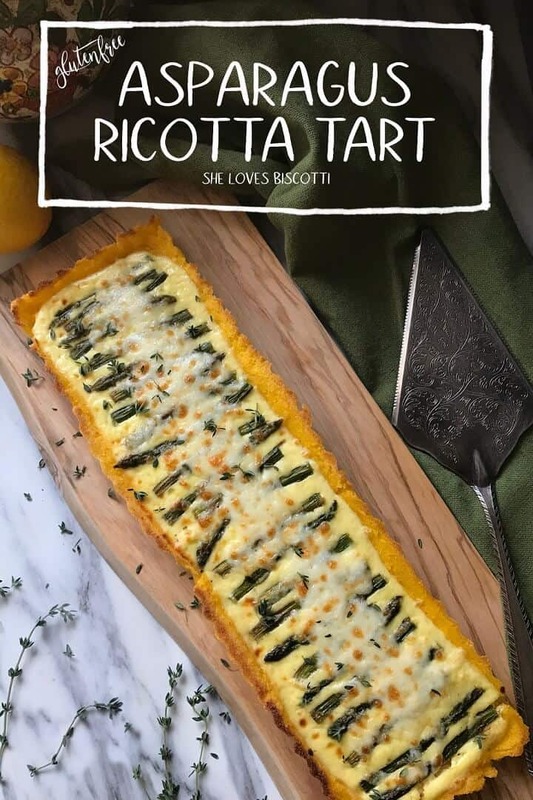 Now of course, I don’t think Aristotle was thinking of asparagus or ricotta or cornmeal (polenta), but his famous quote about synergy can definitely apply to this wonderful savory tart. 🙂 When this combination of ingredients comes together, the final product is so tasty that you won’t even believe where it came from. Let’s take a look at some of these ingredients shall we? Asparagus: Unique in flavor and distinct in appearance, asparagus is one of the healthiest vegetables around. This shoot vegetable is one of the very best sources of Vitamin K and gets the bragging rights of having the highest source of glutathione, an antioxidant which helps liver function (among other health benefits). 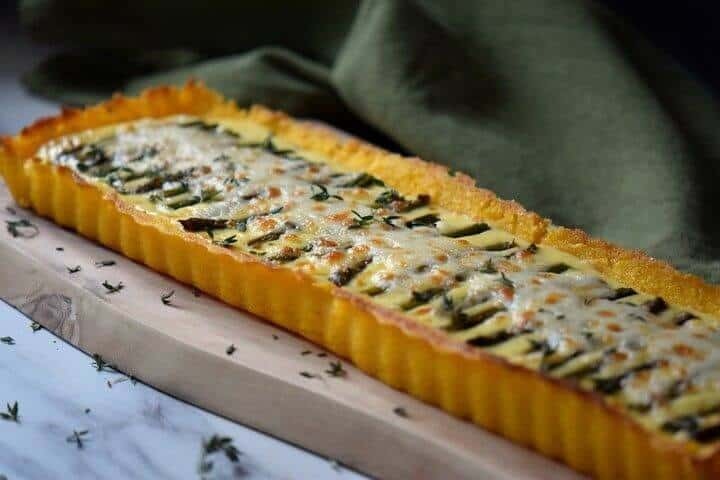 As was mentioned in the introduction, this ricotta tart requires the asparagus to be sautéed for just a few minutes before it is baked with the ricotta. Sautéing asparagus is one of the quickest, simplest and tastiest ways to prepare this vegetable. I have already shared this recipe for Sauteed Lemon Garlic Asparagus; follow it for a flavor combination – garlic, lemon, and asparagus – that really works well as a side dish. I use it often when I am making this Crusted Cod Fish recipe. Cut the asparagus stalks in two (after having trimmed the bottom part). 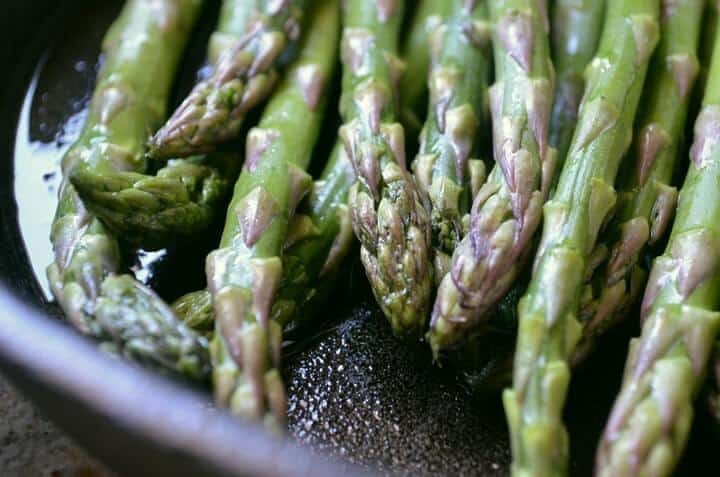 In a large skillet, over high heat, add 1-2 tablespoons of olive oil; add the cut-off asparagus bottoms and sauté for about 2-3 minutes, continuously shaking the pan. Then, add the top half, that is the delicate asparagus tips and crushed garlic clove. Sauté for another minute or so. Just before removing the pan from the heat, squirt a little lemon juice over the top and give it a few more shakes. You may have to vary the time you sauté the asparagus depending on their size. Remember, the asparagus should remain crisp as it will continue to cook in the oven. What can I say about ricotta that I haven’t already said? The versatility of ricotta makes it a great ingredient to use in both sweet and savory dishes. Check out this Rice Ricotta Pie for one of my favorite sweet ricotta treats! It can be eaten fresh, as in these Ricotta Stuffed Medjool Dates, which (by the way) make another great appetizer. Did you know that you can make your own ricotta at home? You will be amazed at the creamy texture and how “fresh” it tastes. You really should try it… I guarantee you will be hooked. Here is the link to my Homemade Ricotta Cheese – I can’t believe it’s already been 2 years since I last shared it with all of you! 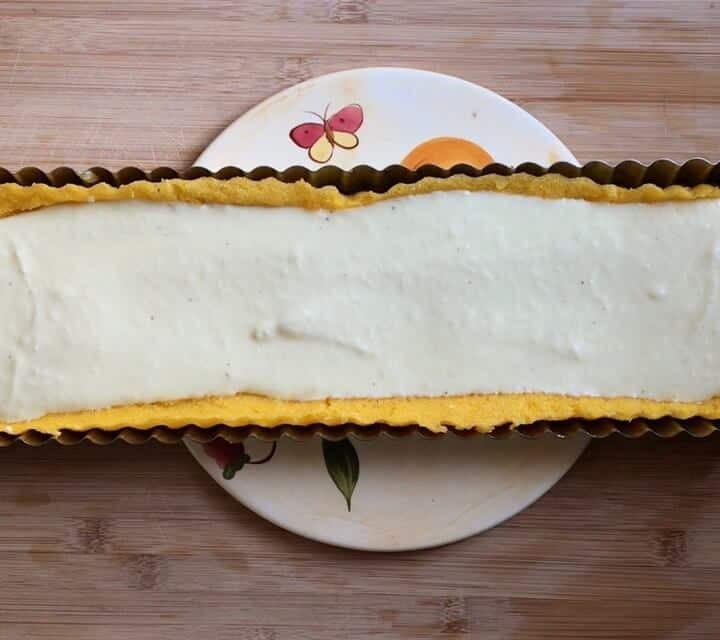 You can feel free to use either commercial or homemade ricotta in this gluten-free tart, as long as it is properly drained. Otherwise, your resulting mixture will be too wet. In the ricotta tart we are making today, we need to whisk together ricotta, Romano cheese, olive oil, lemon juice, nutmeg and pepper. Set it aside while we prepare the cornmeal (polenta) crust. Cornmeal, just like ricotta, is another wonderful ingredient that can be used in sweet or savory dishes. As you probably know, cornmeal is the result of grinding dried corn kernels. In this Asparagus Ricotta Tart, we will be using cornmeal to make polenta that will then be shaped into a tart. This polenta crust tart, once baked, will be the perfect vehicle for the ricotta and asparagus. Let me explain this process. Over high heat, bring a large pot of water to boil. Add salt and olive oil. Reduce the heat to low; slowly add the cornmeal and start whisking. As the cornmeal begins to cook, the starch becomes hydrated. In fact, the cornmeal will begin to gelatinize. The longer the cornmeal cooks (on the stove top) the creamier your end product (ie polenta) will become. 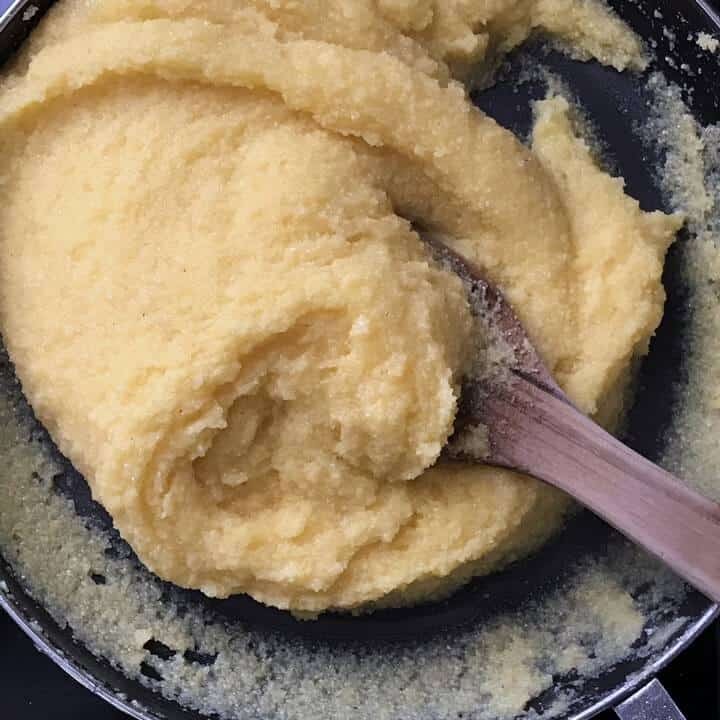 When making polenta, the final product can vary, depending on how you want to serve it. The consistency can be anywhere from soft to semi solid. As you can tell from the picture above, we are looking for a semi solid consistency. Once you have obtained this consistency, spread about 2 cups of the polenta in a long rectangle tart pan with a removable bottom. Coat the back of a spoon with a little olive oil to help spread it out. The goal is to create a little indentation in this crust that will hold the ricotta the second time the crust goes in the oven. You need to work quickly as the polenta tends to stiffen very quickly as it cools down. Please note that the amounts included in this recipe will make two tarts -one filled with ricotta/asparagus; the other I transform in to a herb tart (a non-dairy option). Bake the crusts for approximately 30 minutes. Remove from the oven and allow to cool down for a few minutes. …followed by the sautéed asparagus. Back in the oven it goes. 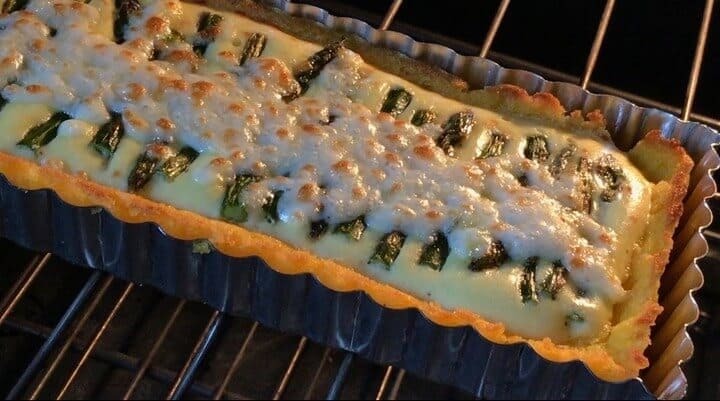 During the last few minutes of baking, add some grated mozzarella cheese down the center and broil. Keep an eye on it and pull it out when the cheese begins to bubble and change color. Garnish with fresh thyme and you are done. 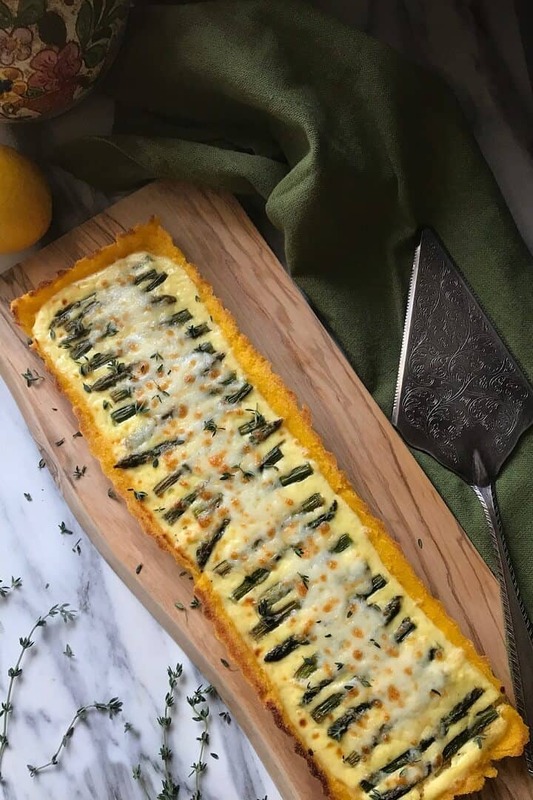 This Asparagus Ricotta Tart can be cut in little bite sized morsels or it can be sliced in little rectangles or triangles. It is best served the day it is made. 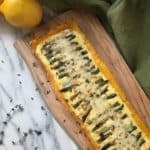 Please note that the measurements for the cornmeal in this recipe will make two tarts – I usually make one Asparagus Ricotta Tart, but keep the rest of the cornmeal to make a polenta pizza (a non dairy option for family and friends). My mom inspired so many of the recipes that I share with all of you on my “She Loves Biscotti” blog, and this is no exception! A while back, I shared this Polenta Pizza with herbs with all of you. This was a recipe that my mom would make a few times a week… a staple during my youth. More often than not, it would be spread out on a large sheet pan (free form) and covered with lots of rosemary, garlic and olive oil. I use this recipe as a polenta piecrust for all kinds of wonderful toppings. 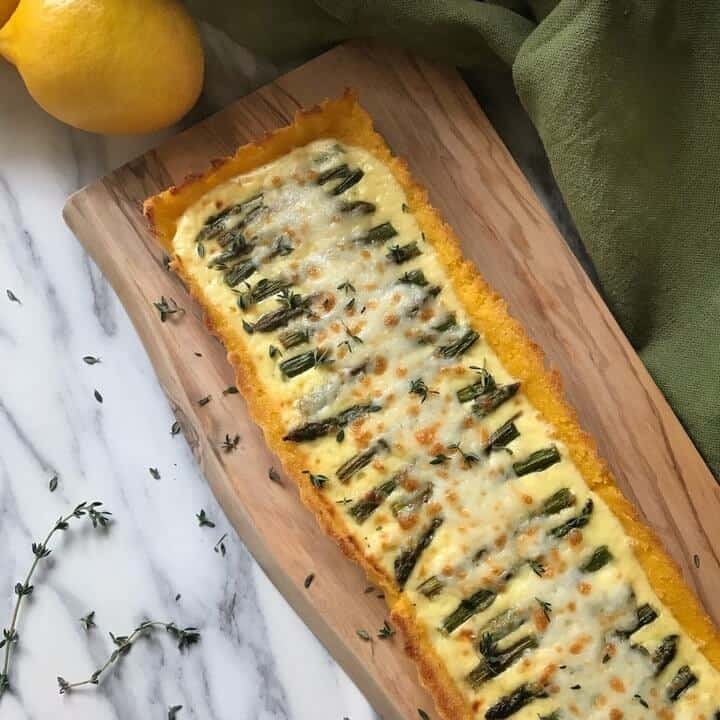 In fact, this tart recipe is the combination of two recipes: Polenta Pizza and Sauteed Asparagus. I just needed a filling to join these two parts together and I thought that ricotta would work perfectly… and it did! This asparagus ricotta tart will definitely become a hit with family and friends. 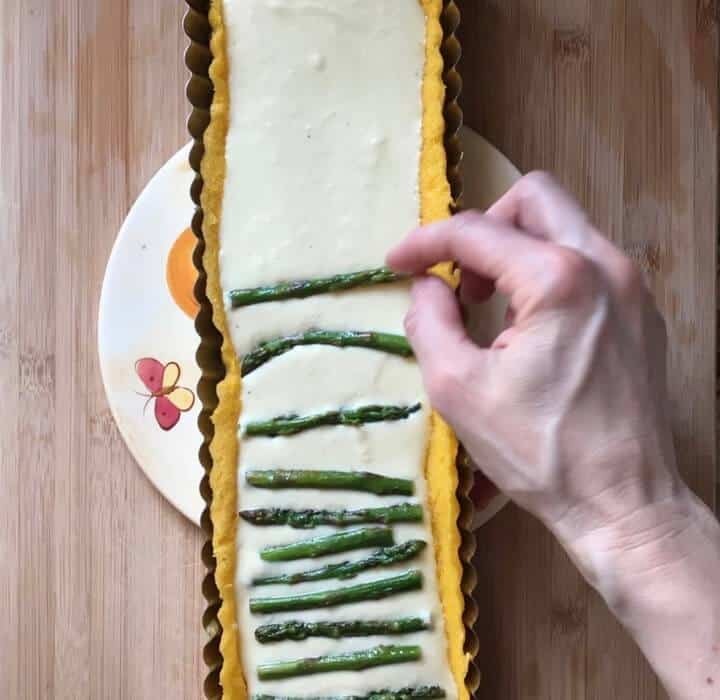 ★★★★★ If you have made this Asparagus Ricotta Tart recipe, I would love to hear about it in the comments below and be sure to rate the recipe! This gluten-free savory Asparagus Ricotta Tart has a smooth ricotta filling & is topped with sautéed asparagus & cheesy mozzarella. You'll be amazed at how crispy this cornmeal crust tart becomes once it is baked. This will quickly become one of your best recipes for party appetizers...your guests are going to love it! Cut the asparagus stalks in half. In a large skillet, over high heat, heat 1-2 tablespoons of olive oil. Add the cut-off asparagus bottoms and sauté for about 3 minutes. Make sure to give the pan a few shakes during this process. Add the top half of the asparagus and smashed garlic clove and sauté for another minute or so. Just before removing the pan from the heat, squirt a little lemon juice over the top and give it a few more shakes. Set aside the sautéed asparagus while we prepare the polenta. Preheat oven to 400°F (200°C). Position rack to center. Spray a 14 x 4.5 inch tart plate with non-stick spray. Set aside. While waiting for the water to boil, whisk together fine and coarse cornmeal in a bowl and set aside. Add salt and olive oil to the boiling water. Whisk in the cornmeal; whisk continuously for about 2 minutes. When the mixture begins to thicken, use a wooden spoon and stir for another 5-7 minutes. Mixture will become thick. 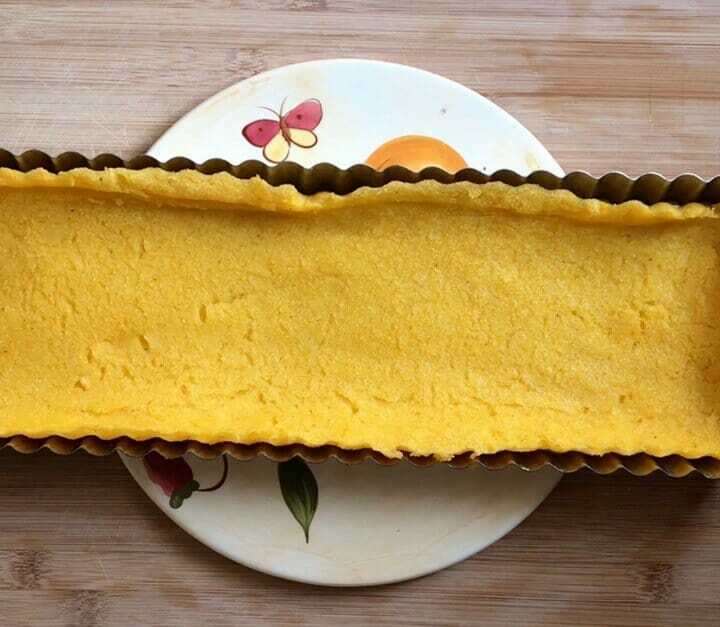 Spread about 2 cups of the polenta in a long rectangle tart pan with a removable bottom. Coat the back of a spoon with a little olive oil to help spread it out. While the polenta is in the oven, prepare the ricotta filling. In a bowl, whisk together the ricotta, Romano cheese, olive oil, lemon juice, nutmeg and pepper. Set aside. 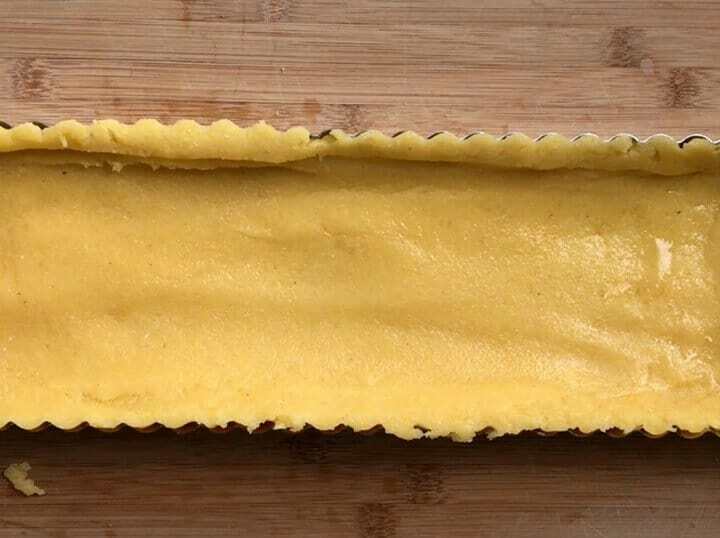 Remove the tart from the oven and allow to cool for a for minutes. 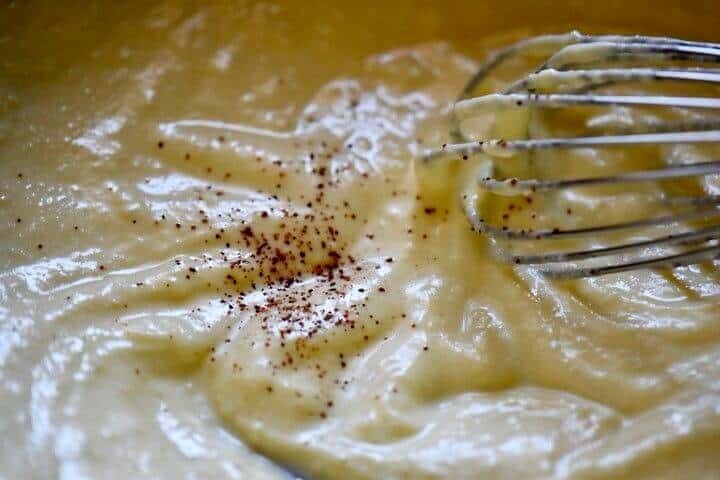 Spoon ricotta filling into polenta tart crust. Place the sautéed asparagus on the ricotta filling. Reduce the heat to 375°F and bake for about 20 minutes or until the ricotta is set. Sprinkle grated mozzarella cheese down the center and broil for a few minutes until bubbly. Remove from oven and garnish with fresh thyme. Time to sauté the asparagus will vary according to its size. Asparagus should remain crisp as they will continue to cook in the oven. Please note that the measurements for the cornmeal in this recipe will make two tarts -I will make one Asparagus Ricotta Tart and the other I will make into a free form Polenta Pizza with herbs. We can never get enough asparagus at this time of year, and this tart is stunning. I love the ricotta and the polenta combo, and I can imagine this would disappear so quickly at any gathering. Beautiful recipe. Thanks for sharing, Maria! Thanks Colleen! Asparagus really is such a wonderful vegetable… can’t wait for the local produce to make an appearance at the markets. Appreciate you stopping by, have a wonderful week-end! This looks perfect for asparagus season! And I love how cheesy it looks. What a great way to enjoy one of my favourite veggies!